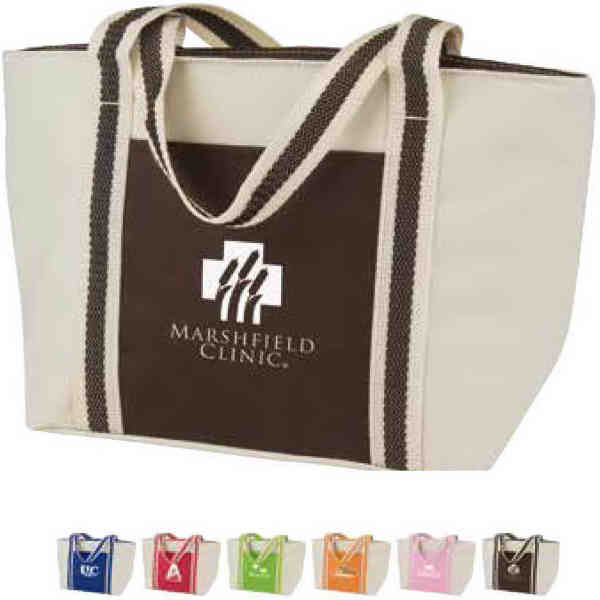 Make sure your brand answers a need from your target audience with this mini-tote lunch bag! Made of 600 denier beige polycanvas, this bag measures 12" x 7 1/2" x 5" and is offered in a number of accent colors. It features a zippered, foil-lined main compartment, contrasting colored front pocket and matching color striped web handles. This bag holds up to six cans, making it easy for recipients to share drinks and your brand with friends and family! Size: 12 " x 7 1/2 " x 5 "